The post prior to last cleared the air in relation to some ways in which the systems sciences seem to go astray in their treatment of foundational concepts relating to the energy view of physical phenomena, specifically those associated with the science of thermodynamics in its classical or macroscopic form. It’s a noteworthy irony that in taking a macroscopic view, the classical approach deals with thermodynamic behaviour at the level of “whole systems”, and in doing so, shares significant commonalities with the systems sciences. An important distinction is that whereas the systems sciences set out to do this as a self-conscious corrective to perceived inadequacies of reductionist science, in classical thermodynamics this is instead a natural entailment of dealing with phenomena that, as discussed previously, are of a systemic character. I have a hunch that from within the systems sciences, the underlying systems orientation of classical thermodynamics tends to be missed due to differences between the domains of reality with which each field was principally established to deal. In the case of the systems sciences, based on von Bertalanffy’s general system theory, this was specifically biological phenomena. Subsequently, this was generalised to phenomena that are recognised as self-organising—including social phenomena, but also encompassing physical phenomena involving regulation by feedback mechanisms. Classical thermodynamics was established to deal with physical phenomena, specifically regularities associated with their activity—that is, with regularities in the ways that change unfolds in the physical world. Its foundational principles, though, were established in relation to a particular class of such phenomena: the human artefacts we know as machines. This is often cited as the point of departure for the systems sciences—the machine behaviour for which thermodynamics was originally formulated is deterministic, and can be dealt with adequately by reductionist approaches. The machines themselves lack the capacity to self-transform. In this respect, the human-created machines dealt with by thermodynamics can appear on cursory inspection to differ fundamentally from biological mechanisms. To compound ironies, though, this apparently fundamental difference arises only if we ignore a basic systemic insight: machines—as with human technology in general—to be comprehensively understood, require consideration in their social contexts. Machines do not exist in isolation—they are products of humans who are at once biological beings with interior psyches living in social relationship with other beings—and as such, any machine as a physical entity operating in a physical domain is better understood as both a physical and a bio-psycho-social phenomenon. This is not just a point of abstract philosophy: it allows us to see how even a machine that transforms its inputs to outputs in predictable ways that are entirely determined by its fixed physical structure can nonetheless be modified by its human users to behave differently. If it breaks down, it can be repaired; and in learning about its operation, subsequent generations of machines based on its design can be adapted to changing operating conditions and human desires. If we focus attention on the machine in isolation from its social situation, we may well be able to understand and characterise its normal operating behaviour entirely on the basis of reductionist science. Its design and manufacture may have been carried out on the same basis. The machine itself may demand no systemic insight of its designers, owners or operators. Understanding the machine as a social phenomenon, though, is an entirely different matter. In viewing such a machine in its human context over its life-cycle, we reach the limits of reductionist approaches, and systems approaches start to come to the fore. My caricature view conflates “applicability to the physical world” with “necessarily reductionist”, and in this sense would be mistaken: classical thermodynamics deals with systemic phenomena systemically, and is entirely capable of dealing with the energetics of systems that are regarded as self-organising. The energy view is inherently an entailment of a systems perspective on physical behaviour. The domain of reality that it deals with, though, being that of physical (mechanical, chemical, electrical etc.) interactions amongst material components, is far less complex than the domain of biological interactions, and in this respect its systemic character is obscured if we treat the biological world as our proto-typical exemplar of self-organisation. Even so, self-organising behaviour is readily identified in the physical world, one obvious example being cyclonic storms or hurricanes, and the methodologies of the systems sciences are recognised as relevant for dealing with such phenomena. On this basis, any assumption that “science limited to physical phenomena” entails “reductionist by nature” is in any case invalidated from within the systems sciences themselves. Given this last point, a further factor may be at play in the strange rift between classical thermodynamics and the systems sciences: the reified view of energy as an inherently existent entity or object-like “thing”. Establishing sound foundations for i) appreciating the systemic basis of the energy concept; ii) understanding why the reified view has serious practical implications for the ways we organise our societies and hence serves us so poorly; and iii) organising our thinking about energy in ways that avoid these pitfalls, lies at the heart of Beyond this Brief Anomaly’s purpose. If we treat energy as an inherently existent entity, rather than as a conceptual construct that can be usefully applied to taking an energy view of physical situations, then the science that deals with this “thing”, energy, can in fact appear to have the same reductionist structure as other sciences that deal explicitly with their domains in terms of real, physically existing entities. The origin of this situation, though, lies in the interpretation of the science by those of us who hold to the “energy as entity” assumption, rather than in the science itself. Remove this interpretive layer, and the science of thermodynamics can be appreciated for its systemic character—and the path is opened to dealing with energy-related questions in ways that might better serve us as we seek out ways of living well together in the face of mounting socio-ecological adversity. This is the task to which I’ll now apply a sharpened focus, as we consider further what it means to approach our inquiry from a systemic worldview. My immediate motivation here is that bringing such a worldview to bear on the relationship between energy and society (as we’re doing throughout this inquiry) will pay particularly worthwhile dividends, in terms of the insights it enables, as we delve into the broad theme of efficiency—understood in the most general terms as the value derived from the effort invested in, or inputs applied to, what we do. To start us down that path I’ll take the by-now-familiar step of making an important distinction that may not be immediately obvious at first glance. In the introduction to thinking with systems early in the inquiry, I presented systems ideas as conceptual tools for making sense of any situation in which we’re interested. The focus there was on some basic concepts, categories and ways of applying them in practice that allow us to render a situation we’re dealing with in formal systems terms. The title of that post, and the two subsequent to it, was carefully chosen: the concepts were presented as “thinking devices” that could be taken up and applied by anyone motivated to do so, regardless of their natural inclinations in this regard. I also made another important distinction there between what I termed the hard systems approach—in which “systems” are taken to be real, inherently existing things out in the phenomenal world independent of our inquiry—and the soft systems approach—in which we use systems ideas to structure our thinking and to learn about situations as we encounter them, without assuming that the world is actually structured in the ways that we depict it to be in systems terms. This is a subtle point: it involves a shift in the way that we understand the relationship between ourselves as subjects, and the objects that arise for us in cognition. As we’ll see in a moment, this particular relationship is one of several that mark a systemic worldview as qualitatively different from other ways of cognising our world. In highlighting again this subtle point, I’m preparing the way for introducing the next important distinction between systems as conceptual tools for thinking about situations, and systemic thinking as a naturally adaptive form of cognitive functioning into which we can grow or develop as is appropriate to the changing life conditions we encounter. In this sense, what I mean here by systemic thinking is distinguished from the way in which the term Systems Thinking is often used to denote a formal approach to understanding situations using concepts such as wholes, parts, environments and boundaries, or to understanding situations in terms of the influences and relationships between elements that are conceptualised in ways such as this. This is not to say that the practices often referred to as Systems Thinking are antithetical to what I mean by systemic thinking. The insights, practices and techniques associated with Systems Thinking are generally commensurate with the form of thinking that I’m characterising as systemic. Systemic thinking, however, may not operate with the particular constructs and categories that are conventional in the formal practices referred to as Systems Thinking; in fact, it may arise outside of any direct connection with such practices and the communities that employ them. In doing so, it seems to unfold in individuals in response to life circumstances for which prior forms of thinking are no longer adaptive—where these prior forms reach the limits of their capacity for adequate sense-making, and hence, in a manner of speaking, break down. In terms of what is perhaps the most widely recognised formal model of cognitive growth, that of Jean Piaget, systemic thinking, considered as a form of cognitive functioning, represents a stage of organisation beyond Piaget’s formal operations. Piaget’s model relates specifically to childhood cognitive development, and formal operations is generally regarded as the potential “end point” of this process. For some time, this was widely considered as the natural conclusion towards which human cognitive functioning could grow, and beyond which there was no further development. The imprint of formal operations can be clearly identified in most of our formal, public institutions—for instance, it is the stage of cognitive functioning necessary for and corresponding with the scientific method as conventionally practised. As such, it is strongly characteristic of modernity and the industrial world. In this respect, it correlates particularly strongly with our instrumental technical success in bringing significant aspects of the natural world under our control (or at least, creating for ourselves the impression that this is the case). Reality, though, has a habit of confounding our theories about how it is or should be. Myriad cognitive performances and products cannot be accounted for in terms of formal operations—for example, writings and theoretical models that exhibit greater complexity than the degrees of freedom available in this form of cognition allow for. We met one clear example of this two posts back, in Ludwig von Bertalanffy’s general system theory. Developments in modern physics, particularly related to quantum mechanics, are also widely recognised as evidence of the further reaches beyond Piaget’s model. Specific exemplar products of post-formal cognition that are frequently cited include Heisenberg’s uncertainty principle in physics and Gödel’s incompleteness theorem in mathematics. The accumulating weight of outliers such as these, emerging at the time of their production from beyond the conventional norms of contemporary culture, would eventually demand that theories of cognitive development transform to accommodate them. In this way, the culture beyond which they were reaching would itself undergo commensurate changes in response. Robert Kegan, in his early book The Evolving Self: Problem and Process in Human Development , cites William Perry’s Forms of Ethical and Intellectual Development in the College Years, originally published in 1970 , as a pivotal study in developmental psychology with particularly wide influence on subsequent research, including that relating to the emergence of systemic thinking (my catch-all terminology, rather than that of any specific researchers) that we’ll come to in a moment. As such, Perry was one of the earliest developmental psychologists to explicitly study this later-stage terrain of interior sense-making. Perry specifically characterises his own work as dealing with cognitive territory that includes extensions beyond that which Piaget had dealt with in his own published research i.e. beyond formal operations. In 1984, research relating to later-stage cognitive development reached an early but important milestone in its own process of maturing with publication of the first book dedicated to the subject, Beyond Formal Operations: Late Adolescent and Adult Cognitive Development, edited by Michael Commons, Francis Richards and Cheryl Armon. Two chapters, the first from Michael Basseches  and the second from Herb Koplowitz , are particularly noteworthy for the clarity that they bring to characterising the contours of systemic thought, and in the process, for helping reveal the ways in which “systemicity” is not simply a feature of the world out there, but a function of the ways in which we make sense of—and in important respects, conceptually construct—such a world in our day-to-day participation in its unfolding. Koplowitz provides an account of the relationship between formal and post-formal thought that is perhaps most explicitly linked with our focus here, and characterises this in terms of four concepts with which longer-term readers of Beyond this Brief Anomaly will already have some familiarity. In particular, he shows how these concepts are understood differently in formal and post-formal thought; with this in mind, and for its general accessibility, it’s his work to which we’ll give most attention. Before doing so though, several key features of Basseches’ work are also worth highlighting given their relevance to our inquiry. I appreciate that in presenting this in its raw form, we’re moving into some rather technical territory beyond the principal terms of reference for an inquiry into energy and society. But this is also strongly consistent with the epistemologically reflexive approach declared at the inquiry’s outset. There are a number of features apparent in this sub-group of schemata that are noteworthy. Of primary significance though is the extent to which these are reminiscent of the key insights associated with the emergence of the energy concept itself in the mid-nineteenth century. What we can see here is a set of ‘moves-in-thought’ that map with uncanny precision onto the energy view as a way of organising thinking about our experiences with physical phenomena. Here we find direct support for the contention advanced throughout the inquiry that energy is inherently an entailment of taking a “systems view” of such experiences. Moreover, we now have a basis for appreciating the way in which a systems view involves a cognitively distinct way of making sense of any situation—representing an emergent form of sense-making beyond formal operations—the validity of which may not be apparent from within the mainstream of modern culture. A possible entailment of this is that for the energy concept to be valid within such a cultural setting, it may well need to be rendered in a form consistent with the way things seem to be from within formal operations. Such a proposition appears consistent with the observed tendency for energy by default to be treated as a concrete, entity-like thing. Before moving on, one further feature of Basseches’ Motion-Oriented Schemata is worth highlighting. Schema 6, Affirmation of the practical or active character of knowledge, has a particular resonance with the way in which I posited the basis for the validity of conceptual knowledge (in the foundational post on the view of knowledge underpinning Beyond this Brief Anomaly) as being its suitability for coordinating practical action. That is, the validity of any conceptual knowledge can, from this point of view, be regarded as the degree to which such knowledge is useful in orienting and guiding us in organising our living together. I just point this out here by way of emphasising again what it is that we should hope to achieve by undertaking a form of inquiry grounded specifically in systemic—or to use Basseches’ terminology, dialectical—thinking. This is not simply a matter of attempting to trump non-systemic views for the sake of proving a point (or worse, as a form of intellectual chauvinism). It is at heart about a concern for how we might better navigate our socio-ecological dilemmas together, and at best, promote generative wellbeing for humanity, by supporting development of robust, flexible and resilient “thought infrastructures” for dealing with the energy-society nexus. Causality: how events are seen as determining aspects of other events. Variables: how objects and forces, and their characteristics, are seen as relating to each other. Boundaries: how the differentiation between two events or two objects is conceived. The permanent object: the conception of self-existing entities in an external world. Table 1: Koplowitz’s characterisation of two post-formal cognitive stages in relation to formal operations. The descriptions of how the concepts are structured at each stage are taken directly from Koplowitz. At the unitary stage, Koplowitz’s descriptions for causality and variables are equivalent to characterising each—as for both boundaries and permanent objects also­—as constructed. The equivalence is reflected in his detailed discussion, where he notes that (for causality) ‘Time and space are both seen as constructs, artifacts of the knower’s attempt to make sense of his/her experience, rather than as intrinsic aspects of reality,’  and (for variables) ‘measurement is more a process of construction than one of observation. Variables do not exist separately in reality, but, rather, it is the nature of reality that it allows us the opportunity to construct variables and to separate them from the unity in which they are enmeshed’ . In this respect, the unitary stage shares much in common with Beyond this Brief Anomaly’s knowledge foundations. While the depiction in Table 1 might seem to suggest that the later stages entail departure from the prior stages, Koplowitz describes a transformation process in which the structuring of the concepts at each later stage “reaches beyond and includes” the structuring at the stage prior. The general system stage encompasses formal operations as a special case, with the unitary stage similarly encompassing the general system stage. That is, each subsequent stage represents a relaxation of constraints in play at the previous stage: formal operations represents a limited special case (or subset) of the general system stage; and the general system stage is a special case of the unitary stage. The distinctions, for each of the four concepts, between formal operations and the subsequent stages, have much relevance for our inquiry approach. For readers who’ve been following for a while, it will likely be apparent that the concepts are associated with underlying themes that shape and organise much of the discussion. Each has previously surfaced explicitly in some way. To date, in developing the systemic intent of the inquiry, it is boundaries and permanent objects that have received particular attention—and that I’ve attempted to use as vehicles for developing insights of a specifically systemic nature. As we explore the broad theme of efficiency in greater depth, the systemic view of causality will play a similarly important role in this respect, and so it’s here that I’ll focus for the remainder of the post. In nominating causality as especially significant here, it’s also worth noting the close association with the concept of variables. Variables can be viewed—for our purposes here at least—as the conceptual tools we use to characterise and represent aspects of situations in which we’re interested that are subject to change. The causality concept deals with dependencies between variables for events—that is, for what happens in a situation of interest through some period of time. Typically when we think about changes in which we’re interested in terms of causality, we’re attempting to come to terms with the dependencies between variables that we’ve nominated as significant. So in recognising these two concepts as distinct and looking at the way that they change with cognitive stage, it’s also important to recognise that the concepts themselves are not necessarily independent of one another—in many situations we tend to understand and make use of them together. By way of a primer on why the concept of causality deserves special attention as we reach for ways of sense-making that might provide greater insight into the relationship between energy and society, I’d like to now make a brief excursion into the work of German sociologist Ulrich Beck. In particular, I’ll introduce his distinction between first and second modernity, and their associated risks, as an exemplar of a widespread shift from viewing causality in terms of linear relationships between independent, real causes and effects, towards viewing causality in terms that could be characterised as systemic. Following this, I’ll return to Koplowitz’s work and explore via a very simple example what it means in more concrete terms to differentiate between linear, cyclical and constructed ways of conceiving causality. A note on style may be of value before proceeding to look at Beck’s ideas. The material that follows is taken from the draft of an academic journal article that I put on hold a while back; it’s close to the original form, and as such doesn’t follow the same conventions that I’ve attempted to adopt throughout the inquiry to reflect Beyond this Brief Anomaly’s stated intent around extending the accessibility of high-quality discourse beyond the initiates of specialist disciplines (I originally stated that intention specifically in relation to energy discourse—but the underlying motivation is more general). Beck’s concept of risk society provides a detailed account of the relationship between the unintended consequences of human activity and threats to humanity itself. Beck distinguishes between what he terms first modernity and second modernity on the basis of the nature of risk associated with each historical phase. During first modernity, stochastic side effects, or risks, associated with particular activities were—and continue to be—typically understood as isolated in time, physical space, and “social space” (the groups of people affected). First modern risks have been widely institutionalised by assigning to them financial value and constructing insurance systems by which associated costs can be distributed amongst all individuals or organisations engaging in risk-generating activities. The key factor in this is the isolability of side effects: recognised risks are those for which institutions—both formal and informal—exist for reaching widespread social agreement with regard to both the relationship between activities and their associated risks, and the allocation of responsibility for the consequences of those risks. That is, the risks are cognizable within established epistemological, cultural, and institutional frameworks. Even though the occurrence of side effects associated with first modern risks is stochastic, given a sufficient pool of historical data and relatively stable social, political, and techno-economic contexts for risk-generating activities, specific risks can be quantified with sufficient confidence to create the impression of certainty. Technical analysis employing instrumental rationality provides a sense that hazards can be pinned down and hence controlled through bureaucratic means. As a result, mutual understanding with regard to the cost-benefit trade off associated with a given activity is readily achieved. In second modernity, the socially constructed nature of risk starts to be exposed, as the capacity of established institutions to mediate our understanding of risk breaks down. Risk becomes dependent for its definition on interactions amongst networks of stakeholders representing multiple sectoral interests and perspectives. The attendant loss of certainty—no central authority can finally arbitrate the definition process on formal grounds—leads to risk conflicts. With risk conflicts, a crisis of confidence arises with regard to conventional pathways for knowledge validation. With regard to potential harm, the present absence of evidence of such harm is no longer necessarily accepted by those potentially affected by an activity as evidence of absence. With the arising of risk conflicts, there is to some degree a levelling effect in relation to traditional power structures and associated sources of knowledge. The legitimacy of conventional sources of knowledge is called into question, and cannot be re-established from within simply by providing more extensive data. A central theme in relation to this is the nature and role of causality in the definition and assignment of risk. As hazards become increasingly separated from their points of origin in space and time, so too the difficulty of connecting particular contributors to the hazard increases. This is taken to its limit in the case of ozone-depleting chlorofluorocarbon (CFC) emissions and global heating-inducing greenhouse gas (GHG) emissions. While this represents only one aspect of the causality problem, the point is hopefully clear: it is no longer possible to isolate, in physical space, social space, or time, parties responsible for an impact. With this, our conventional approaches to allocating responsibility no longer work for us. Moreover, it is increasingly difficult to tie the side effect to specific actions given that the establishment of boundaries becomes contentious. While there may be a temptation to see the transition from Beck’s first to second modernity in terms of a shift in exterior circumstances alone, clearly the situation is more nuanced than this. For instance, large-scale emissions of atmospheric pollutants such as sulphur dioxide that defy conventional risk management have been a feature of modernity from the time of the industrial revolution and hence a central feature of first modernity. Various consequences of agriculture, forestry, and fishing with long term, society-wide impacts could be viewed similarly. While the nature and scale of our technological reach is clearly implicated in recognition of second modern risks, it seems more appropriate to characterise this transition in terms of widespread emergence of capacity to discern risks associated with this reach. Beck draws attention to the cultural dimension of this in highlighting the socially constructed nature of risk: from this point of view, it is changes in the institutional order that give rise to changes in the nature of risk. This is a fundamental part of the story. There is also much insight to be gained by considering the relationship between perception and conception of risks and the perspective-making capacity of individuals through which these perceptions and conceptions are enacted. In other words, what is the relationship between recognition of hazardous side effects associated with human activity—their identification and attribution of causality—and our own interior sense-making structures through which recognition arises? This is a question for which Koplowitz’s exploration of post-formal cognition offers significant insight. The shift in character between formal operations and general system concepts is strongly reminiscent of the shift in character between first modern and second modern risk. In other words, Koplowitz’s generalised description of general system concepts in terms of causality, variables, boundary, and permanent objects seems to correlate closely with features of second modern risk. With this in mind, it appears reasonable to suggest that the world of first modern risk is disclosed by formal operational cognition, while the world of second modern risk—the world of global sustainability challenges—is disclosed by general system concepts, a stage of thinking that develops from formal operational cognition in individuals. Furthermore, given the characterization of first modernity and second modernity as historical phases, one following the other, the widespread recognition that Beck’s thesis has attracted—its cultural acceptance and validation—suggests a shift in cultural worldview, at least amongst some population segments, towards systemic thinking. The proposition I’m advancing here is that the concerns described in relation to second modern risk—the failure of technical knowledge to provide certainty, ambiguous causality, and the contentious nature of problem boundaries—tend to arise when what we’ve been considering as systemic thinking is enacted in relation to a situation that interests us. In important respects then, such a shift in thinking brings into view a world that is not visible in its absence; this provides a hint as to why the theme of construction takes on such prominence in later systemic thinking, with the unfolding of what Koplowitz refers to as a unitary stage. To better appreciate what such a shift might look and feel like in practice, and what it implies about how we understand the world that we encounter, I’ll conclude this post by using a concrete example to illustrate how linear, cyclical and constructed conceptions of causality are differentiated from one another. The first example involves a very simple, micro-scale situation, for which I’ll again make use of our old friend, the stainless steel water bottle from Thinking with systems—Part 1. You can follow along using a similar object that is close at hand; anything around this size will do. Now, I’ve placed the bottle on my desk at an arbitrary position designated A, and around thirty centimetres from A I’ve designated another position as B (I’ve made two small crosses on my desk labelled A and B, using a whiteboard marker); the desk space between A and B is clear of any other objects. I’m now going to push the bottle across the desk from position A to position B, and I invite you to do likewise with your own close-at-hand object. This very simple situation—pushing an object across a surface from one position to another—provides us with all we need to explore the nature of causality in formal operations, general system and unitary terms. On the basis of this simple, concrete experience, I now invite you to consider how you would characterise the situation in causal terms i.e. in terms of cause and effect. Take a moment now to do this. 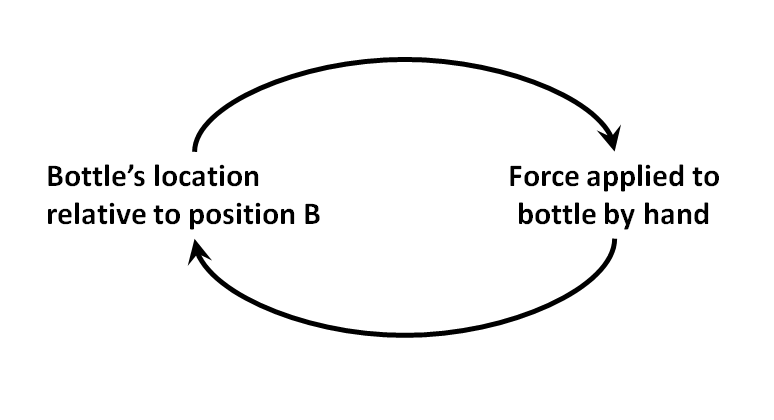 In this alternative view, the force applied to the bottle via the hand of the person doing the pushing is influenced by the bottle’s position, and in this sense we can say that “the position causes the force” and that “the application of the force is an effect of the difference between the actual and desired bottle position.” We can also say, though, that “application of the force causes a change in the bottle’s position”: the change in the bottle’s position is an effect of the applied force. In other words, the force applied to the bottle and the bottle’s position are simultaneously the cause and the effect of one another—we’ve introduced the concepts of mutual causation, and of feedback. Causation in this view proceeds in both directions, the basis for the cyclical view of causality that Koplowitz associates with the general system stage. Having now identified this as a cyclical view, we can now recognise the initial cause-effect characterisation as essentially linear—that is, causality is treated as operating in one direction only. The linear view is closely associated with the idea that causes are independent of and exist prior to their effects. In the cyclical view, causes and effects co-determine one another: something counts as a cause only in the context of an associated effect, and vice versa. As such, we can say that there are no causes in the absence of effects, and hence causes cannot exist prior to effects—causes and effects must arise together, simultaneously. It’s tempting, perhaps, to treat the cyclical view as providing a “true account” of causality for a given situation, or at least, as having a stronger claim for validity than the linear view. Earlier, I noted that the concepts in each of Koplowitz’s later stages can be regarded as “reaching beyond and including” the earlier stages. This structuring across stages is apparent in our example. The linear view is in fact wholly contained within the cyclical view; the cyclical view takes the linear view as it stands, and adds something further to it, in recognising that “effects” provide the context for “causes” just as “causes” form the context for “effects.” The cyclical view adds further nuance to the linear view, rather than simply refuting and replacing it. In this sense, it may serve us better to treat the cyclical view as more comprehensive rather than more correct. The question of how far claims for the cyclical view’s greater validity might extend—or to put it another way, the matter of the limits on such claims—can be addressed in looking to the unitary stage’s constructed view of causality. You may have noted that the casual characterisation of our example situation—in both the linear and cyclical views—represents a greatly simplified account of what actually occurs in pushing an object across a flat, horizontal surface. In fact, in both views, I’ve characterised the situation in terms of just two variables: the position of the bottle, and the force applied by the actor’s hand. At this point it’s worth spending a moment to consider what it would mean to treat these variables as interdependent—as is consistent with our treatment of causality as cyclical. A principal concern in conventional scientific practice is to establish the nature of causal connections between events that are understood to be related, and in doing so to seek reliable, general accounts of why things happen as they appear to. This hinges on the identification of independent and dependent variables. In many branches of science (especially those focused on health and environment, though the approach extends well beyond these fields also), establishing the independence of variables on which other variables are seen as dependent opens the way to identifying underlying, fundamental or root causes of phenomena in which investigators are interested. Inherent in any such endeavour is a linear view of the relationship between cause and effect—it starts with the view that a causal chain can be traced back from a given effect, as measured by a dependent variable, to establish an original cause, measured by an independent variable. On first inspection, it may appear that the identification of an independent and a dependent variable for our example situation is an open-and-shut matter: the position of the bottle is dependent on the applied force, this being the independent variable. This is, however, a consequence of the view of causation that the investigator brings to the situation rather than an account of any underlying cause inherent in the situation itself. As we’ve seen, the force applied to the bottle can itself be viewed as dependent on the bottle’s position; it is entirely legitimate to treat the two variables as interdependent—each as dependent on the other. Viewed from this perspective, there is no ultimate sense in which we can identify an underlying cause of the bottle’s changing position that is independent of the position. We can certainly provide an account of the bottle’s movement in terms of underlying causes, but there is no basis on which we can establish any such account as being true independent of our own account-making efforts. This insight is central to the constructed view of causality at the unitary stage: all accounts of causality are a matter of convention, rather than ultimate descriptions of a reality independent of the investigator. The constructed view is differentiated from the general system view in explicitly recognising the provisional nature of any account of the phenomenon under investigation. The variables that we use to characterise a situation represent an abstraction from what actually happens. The variables that count as relevant depend on the questions that we ask about the situation—there is no ultimate account of the situation that we can provide. We can establish a correct or “minimal set” of variables only in relation to our nominated interests. In our example situation, we’ve been working with a highly simplified account based on two variables only. Our account could expand beyond this, for instance to include other forces acting (friction), the mass of the bottle, the size of the gap between the bottle and the final target position and so on. In this sense, the general system view is always limited—there is no ultimate account of the situation that we can provide, even in general system terms. The unitary stage’s constructed view of causality starts with simply regarding situations as they arise. In our example situation, we might describe this roughly as “hand and bottle moving”. Any description of this in causal terms is a matter of creating a plausible causal narrative about our experience of the situation. Such a narrative might take a form similar to the linear view or the cyclical view, or it may take another form altogether. For instance, there’s a sense in which it’s just as reasonable to say “the hand follows the bottle across the table, until the bottle reaches location B” as it is to say “the hand pushes the bottle across the table.” The first characterisation would also be entirely consistent with the observed performance. In the absence of the bottle, the hand could make the same movement, but we would not consider it to be an instance of bottle-pushing. The hand and bottle together give rise to our experience of the hand’s bottle pushing action. If all causal accounts are a matter of attribution by the account-maker, then we must also accept that not only are there no causes and effects in an ultimate sense, but that the concept of causality is itself an abstraction by which we order our experience of what we encounter, and hence is meaningful only in a conventional sense. Thinking in terms of causality allows us to recognise the interdependence of phenomena, and hence that what we recognise as arising does so in connection with all other arising. In other words, all that arises does so together, in consequence of what has arisen previously, and as the context for what will arise after. We can describe this in abstract causal terms, and indeed in the human world, doing so is essential to the practical business of coordinating our actions with others. But any time we deal with what arises in such terms, we’ll likely be better off if we approach this with a view to aligning our social coordinations to coincide more effectively with realising what we value, than as a search for absolute truth with origins independent of us. In the next post, I’ll look at a real-world problematical situation through the lenses of linear, cyclical and constructed causality, with a view to clearly illustrating how this can have very practical implications in the social sphere of purposeful human activity. That will be a relatively short post compared to this one. We’ll then have established very solid foundations for launching into our in-depth exploration of energy efficiency. Note 1 The full set of second modern risk characteristics that Beck describes is more extensive than that covered here. Kegan, Robert. (1982). The evolving self: Problem and process in human development. Cambridge, Massachusetts: Harvard University Press, p. 228. Perry, William G. Jr. (1999). Forms of intellectual and ethical development in the college years: A scheme. San Francisco: Jossey-Bass. Commons, Michael L., Richards, Francis A., & Armon, Cheryl (Eds.). (1984). Beyond formal operations: Late adolescent and adult cognitive development. New York: Praeger. Basseches, Michael A. (1984). Ch. 10: Dialectical thinking as a metasystematic form of cognitive organization. In M. L. Commons, F. A. Richards & C. Armon (Eds. ), Beyond formal operations (pp. 216-238). New York: Praeger. Koplowitz, Herb. (1984). Chapter 13: A projection beyond Piaget’s formal operations stage: A general system stage and a unitary stage. In M. L. Commons, F. A. Richards & C. Armon (Eds. ), Beyond formal operations (pp. 272-295). New York: Praeger. Basseches, Beyond formal operations, p. 219. Ibid, p. 219, Table 10.1. Analysis of Functions of Dialectical Schemata. Beck, Ulrich. (1992). Risk Society: Towards a New Modernity (M. Ritter, Trans.). London: Sage. Beck, Ulrich. (2004). ‘Conversation 3: Global Risk Society’ (M. Pollak, Trans.). In U. Beck & J. Willms (Eds. ), Conversations with Ulrich Beck (pp. 109-152). Cambridge: Polity. Beck, Conversations with Ulrich Beck, p. 117. Beck, Conversations with Ulrich Beck, p. 120. This entry was posted in Systems approach and tagged causality, cyclical, general system theory, Herb Koplowitz, linear, Michael Basseches, post-formal cognition, reductionism, risk society, second modernity, systemic thinking, systems approach, Ulrich Beck by Josh Floyd. Bookmark the permalink.